Paddy Power Casino Comp Points reward all our customers by simply playing your favourite games. Comp Points are earned by wagering on Casino or Live Casino games via desktop or mobile, and can be converted directly into CASH! Everyone is automatically enrolled! For every bet you make in the casino you’ll accumulate Comp Points – regardless of whether you win or lose! The number of points you earn depends on the games you play (see table below for more details). Example: £10 wagered on Blackjack will reward you 1 Comp point. When you reach 100 Comp Points, you’ll be able to convert your points to cash from the ‘My Casino Account’ section. We’ll give you £/€1 for every 100 points you convert – there is no cap on Comp Points you can earn, the amount you can convert is unlimited. 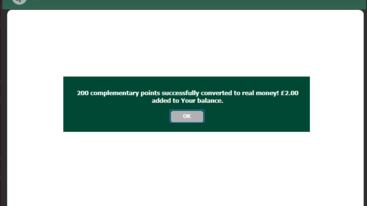 For example, if your account currency is GBP you will earn £1 for 100 Comp Points converted. 1. 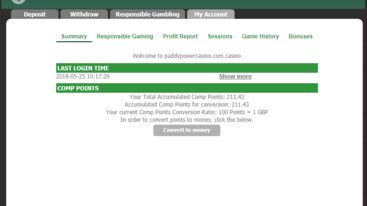 In order to convert Comp Points into money you must be logged in into your Paddy Power account. 2. From My Account menu select My Casino Account. 3. In the new opend window select My Account. Here is where you can keep track of your Comp Point balance. 4. When you decide to convert your Comp Points to real money, click the ‘Convert to Money’ button. The cash will then be deposited to your casino account immediately. 5. The second time you’ll access My Account from you Casino Account you’ll get confirmation of your Comp Points conversion. Your points can be converted in units of 100. Any remaining balance will remain unconverted – for example if you have 1,234 Comp Points and you click ‘Convert to Money’ your account will be credited with 12 units of currency (for 1200 Comp Points converted) and you will be left with a balance of 34 Comp Points. Paddy Power reserves the right to cancel/forfeit any comp points accumulated if a player is found to be low risk betting or using minimal risk betting strategies to gain additional comp points. 1. Paddy Power Comp Points are redeemable in increments of 100. 2. Paddy Power Comp Points cannot be earned on any double-up or gamble options. 3. Paddy Power Comp Points not redeemed within 3 months of your last acquired comp point will be expired. 4. We reserve the right to reclaim Comp Points already accrued or monies gained from redeemed Comp Points if customers are found to be tampering with or abusing any aspect of a promotion, as solely determined by Paddy Power Casino. 5. Customers are not allowed to transfer Comp Points between accounts. 6. 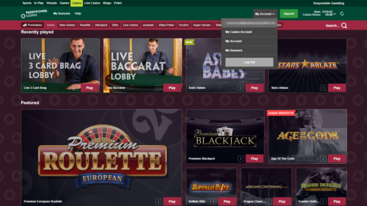 Paddy Power Casino reserves the right to withdraw or amend the Comp Point program at any time and without prior notice. 7. This offer is available to all Paddy Power customers, but is limited to one account per customer, meaning one per family, household address, IP Address, email address, telephone number, payment account number (e.g. debit or credit card, Neteller etc), and shared computer, e.g. public library or workplace.